One should learn from the Japanese on how to market children’s toys in a way that even adults start to have itchy hands. If you think I am exaggerating, have a look at the Japanese manga series written by Takao Akoi. Most millennials will fondly remember the show’s protagonists: Tyson Granger with his brown eyes, front bangs and happy-go-lucky attitude, wielding the Bit-Beast, Dragoon. Max Tate who is the closest to Tyson, a good natured, cheerful kid with his bit-beast, Dracil. Ray Kon who is the epitome of maturity and tolerance, possessing the bit-beast, Driger that resembles a white tiger. And finally the cold, deadly but inherently loveable Kai Hiwatari, with his equally amazing bit-beast; Dranzer. The Beyblade spinning tops first appeared in Japan in 1999 and were developed by Takara Tomy. They were inspired by a traditional spinning top known as “Beigoma”. The idea, however, was borrowed from a board game known as Battling Tops, developed in 1968 by the “Ideal Toy Company”. Beyblades battles are held in arenas known as beystadiums of varying shapes and sizes. The arena curves up to the sides forming a cyclone ridge which allows attacking Beyblades to swivel around with accidentally exiting the stadium. Other prominent features of the beystadiums include recessed disks which spin freely adding an element of surprise to the game if a Beyblade comes into contact with it. The original developer, Takara Tomy designed the stadiums with open sections in the walls where the Beyblades could be launched while Hasbro designed stadiums that had high walls with no openings. Instead he opted to create pockets within the arena which counted as ring-out if a Beyblade were to fall inside them. The game involves two or more players simultaneously launching their Beyblade toys into the arena where they experience hits from each other, the walls or any spinning recesses. A number of events can ensue once this happens. – A Beyblade is knocked out of the arena or enters into a pocket lining the edges of the stadium. This is called a Ring-Out and also awards the opponent a single point. – Two points are awarded if the opponents Beyblade shatters, bursts or breaks. This is called a Burst Finish. – Equal points are awarded to both players if the match results in a draw; where either both Beyblades stop spinning simultaneously, are kicked out at the same time or burst at the same time. As previously mentioned, Beyblade toys come in many shapes and sizes. But the feature that makes Beyblades stand out is the fact that they are customizable. Entire sections can be interchanged to make it better suited for opponents with different strengths. ATTACK BEYBLADE – One of the most common types, they try to knock out the opponent’s beyblade as quickly as they can rather than try to survive them. They are strong against stamina oriented Beyblades but weak against Defense Beyblades. DEFENCE BEYBLADE – They are built to withstand heavy attacks which make them suitable to handle attacking opponents. They are heavier, so the added weight is helpful in deflecting attacks from lighter attack beyblades. However, the added weight means that their launch speed is slower which means that they are often outlasted by Stamina or Endurance type Beyblades. STAMINA BEYBLADES – They are build not to hit or defend but to outlast by spinning for as long a time as possible. So the further away they stray from their enemy, the more likely they are to win. This makes them naturally prone to being ousted by attacking beyblades. BALANCED BEYBLADES – These beyblades combine the above features in roughly equal amounts to create an overall package that can attack, defend and endure, but one that doesn’t excel in any particular department. Let’s explore the various types of Beyblade systems. Made almost entirely of plastic and consisting of four parts. Attack Ring: This is the outermost part of the beyblade, located on the very edge and is the first part to come into contact with an enemy beyblade or any other obstruction. Therefore, an attack Blade’s effectiveness greatly depends upon the quality of the attack ring. Blade Base: This is attached to the Attack Ring and determines the movement pattern of the Beyblade. The Spin Gear utilized determines whether the Beyblade spins clockwise or anticlockwise. Bit Chip: A decorative item held in place by the attack ring, right in the top center. The Bit Chip typically has the insignia of a mythical creature i.e. a bit beast. The concept is further explored in the Manga. Weight Disk: This is made out of metal for the sole purpose of adding weight to the Beyblade, so that it doesn’t get pushed around too easily and is able to defend itself. Greater weight also means more momentum and inertia so the top spins longer. This is one of the only parts of the Beyblade not made out of plastic. As the name applies, this system applied magnets (to the Beyblades and Beystadiums) to introduce more fun to the games. This was a part of the V-series of the Manga. The Weight Disks and Spin gears were magnetic which either repelled them from Beyblades, or attracted them, depending upon polarity. In Addition, certain points on the walls of the stadium also had magnets inserted to affect the movement of the Beyblade toys. This system features slightly more advanced Spin Gears, known as Engine Gears. This included a Turbo Winder, which worked on basically a wind-up and release theory. During battle, the Engine Gear would release and provide a necessary boost to the Beyblade in question. There are four common types of Engine Gears: The Default one, The Turbo Engine (Possesses a more powerful release), The Reverse Gear (Engine spins in the opposite direction to the rest of the Beyblade, which produces some excellent zigzag movements suitable for attack but also happens to reduce spinning speed) and The Gyro Engine (where the tip spins independently of the beyblade, allowing for a place to insert a ripcord, removing the need of having a launcher). Differing kinds of Blade bases are used in connection with a Clutch lock system which has an effect on the Engine Gear. Instant Release: Immediate burst of speed as soon as the Beyblade is Launched. Steady Release: The Engine Gear is triggered in the beginning but the release is slow and steady over an extended period of time. Hit Release: The Engine Gear is triggered when the Beyblade collides with something or if it slows down, giving it a much needed boost. Middle Clutch: A midway point between Steady and Hit, in which the Engine Gear is triggered in the middle of the battle, neither too soon, nor too late. 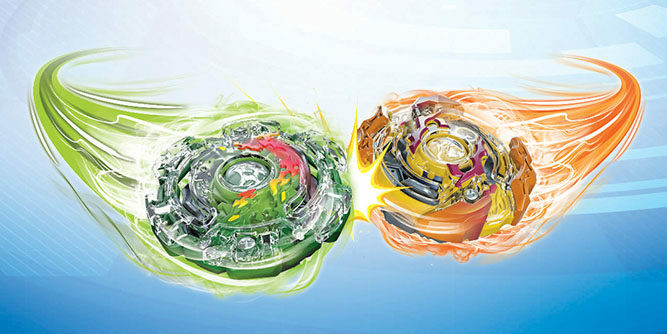 The first series to use metal instead of plastic in their Beyblades. These tops spun twice as fast and lasted longer which gave them a heavy advantage over their predecessors. The heavy metal system features Bit-protectors instead of Bit chis. While the Bit Chip served no purpose other than being a decor item, the Bit Protector binds together the different parts of the Beyblade and is made of metal. The weight disks of this system are completely circular with customizable options. The Engine gear of a typical system is replaced by a Running Core which acts as a Blade base. The highlight feature of this system is that the Beyblade is designed to separate if it has sustained a threshold level of damage. The Performance tip has spring which releases and provides a burst of added power at the moment of separation of the top. The system consists of the Energy Layer, Forge Disk and a Performance Tip. Marketed under the brand of Metal Fusion, this system featured more complex Beyblades. A lot of the metal parts in the previous versions were once again replaced by plastic. The wheel, for instance, was made of polycarbonate. This was further expanded upon in the 4D systems, which introduced a better fusion wheel,, known as the 4D fusion wheel. The fusion wheel is essentially a metal piece that is the primary piece which comes in contact with an enemy beyblade or any other obstruction. The previous systems had a Face Bolt which held the top together, a spin track and a performance tip which influenced the spin patterns of the Beyblades, whether it behaves aggressively or defensively. The Beyblade spinning toys were extremely popular among children, largely due to the overwhelming success of the manga series. The series was also released in North America in the English language after Viz Media obtained the license for it. The original Bayblade toys are easily available at Toys R Us, Walmart, Target or online at Amazon or Ebay to name just a few retailers. This was followed by an anime series, spanning three seasons, each season fifty-one episodes long: Beyblade, Beyblade V-force, Beyblade G-Revolution. There have also been two spin-off series, two theatrical films and a live action adaptation is currently in the making as Paramount Pictures have acquired the rights for it.